It is not often that the temp goes above 45 degrees in January in Wisconsin. So, with the temps in the 50s and high 40s the last two days we have been out exploring! We went to check out a new park. They just put in the play structure at a park that already had a splash pad and a great trail around a fishing pond. It is a great combination of different type of outdoor play! We can't wait to have picnics there, water play, fishing and exploring! We have also been doing some hiking. Avery is loving walking with her hands in her pockets and I think it makes her look like such a big girl! We went and checked out Lake Mendota. The ice is not safe to walk on anymore (someone's fishing shanty and ATV went through this weekend, luckily they weren't hurt!) but it is fun to throw rocks and see if you can get them to break through. The warm temps also means there are lots of muddy puddles to play in! It looks like it is going to be pretty warm for the next few days as well. All of our snow will probably be gone by the end of the week. Sam is super sad that her snow fort is disappearing. I keep telling her that winter isn't over yet and more snow will be here soon...but I am starting to doubt that! Where is out Wisconsin winter? Are you still getting outside everyday? Update me on how your Everyday Outdoor Play in 2012 is going! Do you have your shovels out? Sleds ready to go? Kid's toys all picked up out of the yard? If you live in WI I sure hope so because the snow is coming!! Finally we are going to get some winter weather. The snow is suppose to begin tonight and then keep coming all day tomorrow. I am hoping for A LOT! So today the girls and I (well the girls really while I sat on the stairs of the deck with my head between my legs; my awesome daughters have given me whatever virus they had and it has hit me hard!) cleaned up all the outside toys and got them packed away again. We pulled out their buckets, shovels and little rakes and put them in a safe place so they would be ready for snow play. The girls are super excited to be able to build snow castles! I got the idea to keep the shovels and buckets out from Tanya at Family Adventures in the Candian Rockies (an awesome new blog that I recently discovered!) The idea of sand toys as snow toys had never occurred to me and it is genius! Tanya posted an adorable photo of her little one playing in the snow with his bucket and shovel and I instantly knew I needed to keep our stuff out. While the girls were sick last weekend I also got to work on a new piece of winter gear for them, neck warmers. Sam picked out the bright pink princess fabric for both of them. With no sewing machine this was quite the project for me to tackle but in just three days I got them done. They are a snug fit (my measuring could apparently use some help) but will work well for this year. Sam was very excited to wear it. I wanted the girls to have neck warmers because they are easier and more convenient for kids than scarves and they can wear them just around their neck, or pull them up over their faces when it is super cold or they are doing something like skiing or sledding. If you are interested in how to make them shoot me a comment and I will do my best to explain! How is your family getting ready for the snow? Once we have snow getting out in it to play is a big priority for us. I want to make sure that we constantly have something fun to do outside. I think little kids most often get cold quickly because they are bored and uncomfortable playing the snow. Being creative and having fun things for them to do in the snow can really help them to stay warm and having fun outside even in the cold. So, if you have any posts with snow play ideas or have anything to share please let me know! I have also created a pinterest board for snow play, so I will be sure to add any links that you have to that Board as wel! Winter has come but unfortunately so far has not brought much snow. At least not snow that is sticking around! Cold temps with no snow is probably my least favorite weather situation. But we are making it work and today we headed to one of our favorite spots, even when it is the "off season". We headed to the Henry Vilas Zoo, in Madison. We didn't see all the animals that the girls like, no girafffes or bears or prairie dogs but we did have a great time watching the lions, getting to pet a snake, watching the monkeys play and a very active river otter. The girls got to play on the big tree house jungle gym and some great outdoor play time. Of course I forgot my camear. BOO! The biggest perk to going to the zoo during the winter? NO CROWDS! The girls can always have a great view of the animals, one on one attention with the zoo keepers/naturalists that are in the exhibit areas and can play freely on the climbing equipment without big kids to push them around or make them nervous. My biggest tip about taking your little ones to these kind of attractions in the off season is to set them up for a different experience. They won't realize that it will be different unless you tell them. If they are use to riding the carousel and then they can't because it is closed during the winter, don't let this be a surprise when they get there, prepare them ahead of time that it will be closed. Visiting the website of the place you are visiting is a great way to find out what may be closed or, as is the case with the zoo, what animals may not be kept outside in the winter. Even though I had warned Sam we may not see everything she was still sad that the prairie dogs were not out (yes, I know it is weird that my girls really like the prairie dogs!). So instead of trying to comfort her I switched into teacher mode and asked her why an animal like the buffalo (which is in the shelter right next to the prairie dogs) could be out in the cold and not prairie dogs. We talked about their differences in fur and where the prairie dogs might be right now to keep warm. Great learning experience! What outside places do you still visit in the winter? Any tips on how to make the experience a super positive one even though it is different for the kids? With no pictures I have kind of talked your ear off already! So nothing more from me. But here is the post from our last off-season visit to the zoo! I saw this cute rainbow activity on Rockabye Butterfly and I thought it would be a perfect fit for our rainy week. We looked up some pictures of rainbows online so that Sam and Avery could see the real thing. While we were looking at pictures I talked to the girls about how rainbows were made, when to look for them and where to look. And of course the girls instantly wanted to check outside to see if they could find a rainbow. Super simple activity. We were out of green construction paper, we typically run out of that one first, so we used green tissue paper. This activity was great for color recognition and counting. Plus it was good cutting practice for Sam too! The forecast around here is rain, rain and more rain. But we are making the most of it and embracing the rain! The girls loved standing out between rain storms today and just feeling the wind and the cool air. The wind was so strong and if it had not been a spur of the moment, on our way out of the house, kind of activity I would have loved to get pictures of how they were moving in the wind and watching each other's hair blow. We also wanted to do some painting today. When we paint we are always in one of two spots; the girl's little art table in the basement that just faces a wall or the kitchen table. At the kitchen table they can kind of turn around the peek out the windows but with the deck right there it is not a great view. So, today to help them feel more inspired I decided to set all of out paints up right by the basement door, with a great view of the backyard and the cloudy sky. There were huge black/grey clouds moving fast across the sky and I knew that would be the first thing the girls saw. Sam and I had fun mixing the paints to come up with the right colors of grey, black and blue for the clouds. We added rain drops with our fingers and even some lightning. Avery had fun painting clouds too! Avery just kept painting and saying "oud" then "ta-da". Which translates to "cloud" and "ta-da"! So cute. So, we painted clouds and watched the rain for a while. Sam still asks why it rains and I have started saying "why don't you tell me". The answers that she gives me are so great. They usually have to do with us needing more tomatoes or pumpkins which we can't have if it doesn't rain. And I love having her tell me all about where the rain comes from too. She always says that the clouds "are just too heavy". I think it is great to not have my girls sad about rainy days. Similar to cold and snow, I want them to embrace every different type of weather! 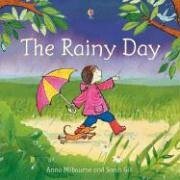 Here are some of our favorite rainy weather books! 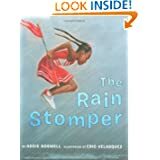 And I "pinned" several other rain books that I am interested in checking out! So if the weather continues a trip to the library for some rainy day books may be in our future. 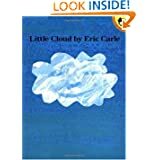 blue food coloring, white paper and then "rain makers" such as eye dropper, baby medicine syringe, turkey baster, spray bottle, old saline container, etc. Our final product was not much to look at but the process was fun! You don't need anything for this one except yourself, a child or group of kids. Talk about how rain can start out slow with just a few drops and then it can get faster and louder as the storm builds. Have kids hold up two fingers on each hand and then pat those sets of fingers together. Hold their fingers up to their ears as they pay so they can hear the quiet sound of slow rain drops. Then have them use all four fingers and make the same patting motion. Have them do full hand clapping to make the rain even louder. Then tell them that the storm has gotten even bigger with pouring rain and thunder. Have them stomp their feet while they clap their hands! This sequence can then go back down the other way so that the storm can slow down and stop. I have done this activity with Sam and Avery and a group of preschoolers, it is always a hit. 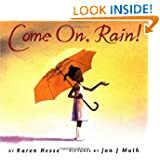 For books to go along with these activities on rains and storms check out the Must See Children's Books page on the sidebar. She begged. And the other one whined and pointed. I think it is probably only my kids that would want to go outside when it is 35 degrees, snowing/sleeting and thundering. In December, January or February sure, no problem to go out with a dusting on the ground and 35 degree temps. But in APRIL? I do not think so. All the winter gear is packed away. What a hassle. BUT my girls wanted to. Really wanted to. Can you guess who won? Avery's coat and snowpants from this year were ridiculously too small and since I had to un-do the winter gear bin anyway I figured why not have her wear next year's stuff! She looks a little silly!! And thank you Tami for the inspiration of what we should do while we were outside today. A snow bunny! HA! The leaf mouth did not stay on very long in the rain/snow/sleet that fell in increasing larger amounts but I think it is still pretty cute. Sam thought it was hilarious to make an Easter bunny out of snow. The ridiculousness is not even lost on a three year old! I am glad that we made it out today even for just a little while but this weather could really start improving quickly. I am pretty sure the cute, pastel little spring dresses that I have for the girls for Easter are not going to work if there is snow on the ground! Wouldn't it be wonderful if schools had the same committment to getting outside that some parents do? I can remember back to elementary school that even if there was a drizzle of rain outside we had to stay in the gym for recess. Now I understand that the teachers have to work with what they are given; if not all kids are dressed appropriately for the weather then it would not work to go out. But if schools made it a committment to get outside no matter the weather then maybe parents would make more of an effort to send the right gear along. I just hate that in a few years when both girls are in school so much of their outside time will be dictated by the school or by what we can fit into the evenings and weekends. Does anyone have a school that fights hard for outside time? A school that works with parents on making sure kids have the right gear for the weather? Any parents ever complained or tried to get their kid's school to get outside more often? I know recess is something that is being cut more and more in the schools but do parents have any recourse against this, any way to prevent it being cut all together? Most of the time rainy days mean great days to watch movies and take long naps. Not great days to learn about nature or get outside. But that doesn't have to be the case. Rainy days can be great days to experience nature, learn about it play outdoors! Here are some great ways to enjoy a rainy day. 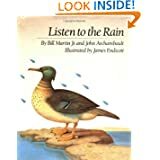 Read a rain book. 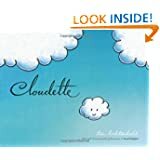 You can check out some of our favorites over on the Must See Children's Books page on the sidebar. Or just ask/search at your local library. Measure the rain. Make a simple rain gauge and set it outside. Throughout the rain storm check to see how much rain you have gotten. If it is rainy for several days you can even make a chart to keep track of the rain each day and make some comparisons. Sink or Float. If you want to venture out there is a great activity you can do in a puddle on the sidewalk or in your driveway. Simply have your child gather items that they find throughout the yard and then test them out in the puddle to see if they sink or float! Sam and Avery both love this activity. They both get a kick out of throwing things in puddles but then Sam does really enjoy figuring out which ones stay on top and which ones she has to reach into the puddle to retrieve. Yes we get wet but that is okay! Puddle jumping! Be brave, bundle up in clothes you don't care too much about and go jump in a puddle or two! Avery isn't quite to the jumping stage yet but she does enjoy walking through them. Sail a boat. With puddles around it is a great time to test out some homemade boats. So using household items or natural items (whichever you have on hand) have your kids make small boats. Then take them outside, find a big enough puddle and see if they can float across the puddle. If they sink or tip over then it is back to the drawing board to try to fix it and then back out to try again. This can be an all day adventure with older kids that really get into creating. And only requires a small amount of outside time if your rain is really coming down. Watch the rain drops. For the very little ones (Avery use to love this last Fall) simply finding a good window that has rain drops running down it and sitting with them to watch the rain drops can be a very relaxing and fun experience. I would put Avery on my lap and use her little fingers to trace the lines that rain drop made on the window. Listen to the rain. Sam still has "fears" of the thunder and lightning so when we do get a big daytime storm I try my best to have us really watch it and listen to it. If I can get her to sit down and really listen to the sounds and talk about them it can help to make it not so scary. We got a pretty big storm last night with lots of rain but it has only been sprinkling today. Sam asked this morning on our way to school if we could jump in puddles today! It is a little bit chilly and I don't have rain boots for Avery yet so I kept her in the stroller but Sam and I did some serious puddle jumping this afternoon. She also tested out some sticks, leaves and one pine cone on the puddles as well. Simple things today but it got us almost 45 minutes of outside time! Which on a rainy day I am pretty happy with. Apparently make a fantastic combination! I got inspired from Activity Mom to check out this site of teaching ideas and free printables. It is a rainy day so I was looking for something to do with weather or rain. I found a finger play activity that involved make rain crowns! Love it. We made the drip-drop crowns first. Cut out rain drops using fun patterned scrapbooking paper. Then Sam and I had some fun making patterns and practicing "what comes next?". Then we made two drip-drop headbands for the girls to wear. We just glued the paper rain drops to blue ribbon. They were worn a lot throughout the day! But we made them so that we could wear them when we did the "Drip-Drop Finger Play". A cute little ryhme about rain drops falling on different body parts. Great way to practice body part identification/naming and a great movement/copying activity for Avery. I thought it would be perfect for both girls. And it was fun for both for a few minutes, but Sam and I both thought it would be more fun with more kids. Maybe one that I share with her preschool teacher! The girl's love of the drip drop crowns got me thinking about how I could make one that would last a little bit longer than paper. So, I grabbed felt left over from a Christmas project (that I never actually did!) and started cutting out weather shapes. The end result was pretty cute and led to lots of discussions about what kinds of weather can happen at the same time. Who knew headbands could be such a good learning tool? And so much fun too! But now I have visions of a kind of weather chart using felt and buttons instead of stickers like we did the last time. We will see if this idea goes anywhere, but maybe! That free printables site I mentioned before has their ideas categorized by seasons and holidays throughout the year which is nice and there are a ton of cute sounding ideas. I would check it out! For the felt crown I simply used buttons that I had saved from pants, you know the extra ones they send. I sewed the buttons on to the ribbon. Then I cut slits in the felt so that the weather shapes could be put on the buttons. Sam hasn't had any practice with buttons yet so she can't change the shapes herself but I think soon she will be able to. At one year old Avery is getting pretty cute with movement and copying activities. She loves to try and do what her sister is doing. She had a lot of fun with the drip-drop rhyme and movement, it just didn't hold Sam's attention for very long. Maybe I just wasn't being energetic enough, who knows. Stopped by Child Central Station today and saw that "What to do With it Wednesday" that she hosts. Leave it to my husband to be the creative one! We are going to have our first rain of the season tomorrow so why not make a rain gauge and measure it with Sam and Avery. I set him and Sam on the task of figuring out to make that happen. The view looking down into the rain gauge. Super simple to make. We took the crystal light plastic container, cleaned it and took the label off. My husbad grabbed the power screw driver, a piece of board, a screw and bathroom caulk. They screwed the crystal light container onto the board from the top down. We thought we would need to caulk it to make it water tight but after several testings the caulk was not needed, it is holding water just fine (for now!). Then we used a marker and a ruler to measure out five inches on the side of the container. The whole thing is very light, small and simple. Sam is excited to set it out in the morning to see how much water we can collect! So, that is what WE did With it Today! There are obviously lots of learning that can occur with this. Sam is just starting to recognize numbers so I am excited for the counting and numbers aspect of this. Once we get a little bit more into actual spring (and not this fluke mid-Februar thaw!) I may even incorporate some recording of rain falls over time on a chart or something. Maybe adding that to our weather chart. I am thinking that caulk might be needed at some point or needed depending on what kind of screw that you use. But only use a small amount so as to not mess up the accuracy of the measuring too much. What would you do with a plastic cylinder, crystal light-type container?